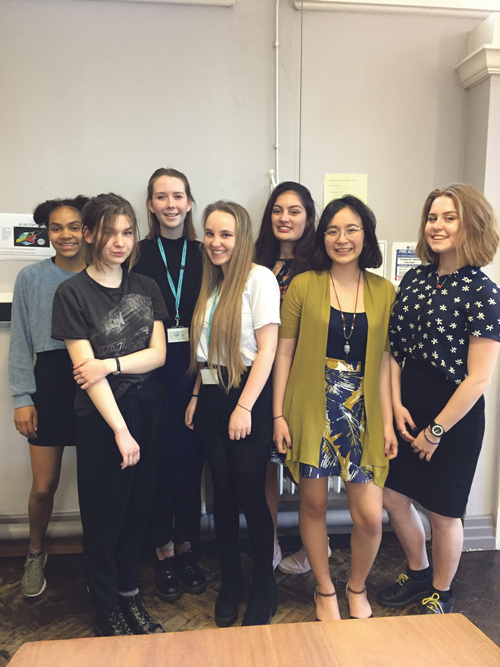 SIXTH FORM students at Colston's Girls' School have been taking action to challenge gender stereotypes. Two teams have won through to the final of Bristol's Community Apprentice competition and will be pitching their ideas to the city's Mayor Marvin Reesn on June 13. Regardless of the results of the contest, though, the girls say their projects have been a success ad have changed their own thinking as well as that of other students in their school and a neighbouring primary school, teachers and members of the public. Taking part in the Envision challenges has improved their confidence and resilience, they say. They have developed websites and social media profiles , taken part in radio interviews and made videos and digital stories. The two teams of Year 12 students each had a slightly different emphasis. Team ph7 focused on challenging careers stereotypes. They held a workshop on a train and created posters that are on display at stations on the Severn Beach line. Team Aspire wanted to improve careers guidance, so began by carrying out research among students and teachers. They found 72 per cent of students and 82 per cent of teachers felt they hadn't received enough advice on careers pathways open to women. "This is an ongoing issue. Advice has not changed since our teachers were at school. We don't want this to come to an end with us - we want it to carry on. We are creating a permanent resource for future students," the team said.